Calculates the 5-year risk for locoregional recurrence (LRR) in breast cancer patient (c-index: 0.71). Patients were selected from the Netherlands Cancer Registry (NCR), a nationwide population-based registry, which records all newly diagnosed tumours since 1989. Women diagnosed with primary invasive breast cancer between 2003 and 2006 without distant metastasis, previous, or synchronous tumours (diagnosed within 3 months after the first tumour, treated with curative intent and without neo-adjuvant systemic treatment were selected from the registry (N = 37,230). Variables were selected based on literature and availability of the data. Patient, tumour and treatment characteristics were assessed for their influence on recurrence risk using multivariable binary logistic regression analysis. Firstly, a prediction model for the 5-year LRR risk was developed. Secondly, risks were determined per year conditional on not being diagnosed with recurrence in the previous year(s). Witteveen A, Vliegen IM, Sonke GS et al. 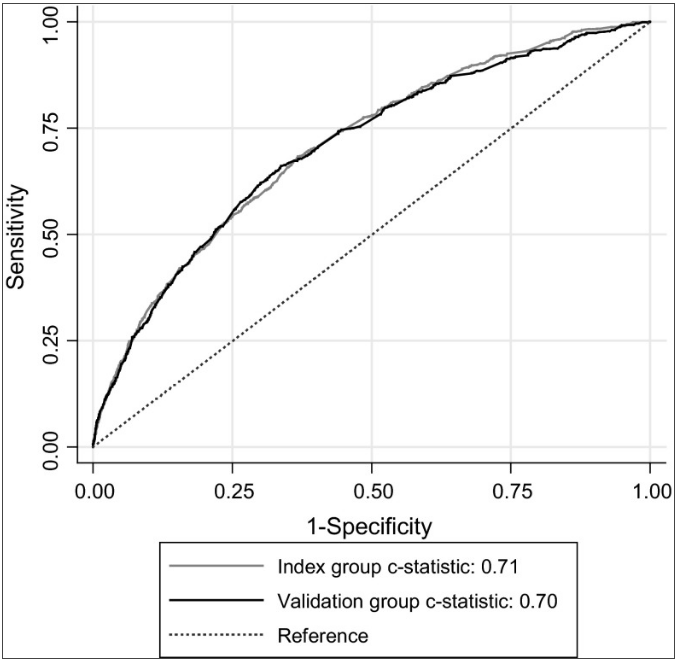 Personalisation of breast cancer follow-up: a time-dependent prognostic nomogram for the estimation of annual risk of locoregional recurrence in early breast cancer patients. Breast Cancer Res Treat. 2015; 152(3): 627–636. This model can be used as an instrument to identify patients with a high 5-year risk of locoregional recurrence (LRR) who might benefit from a less or more intensive follow-up after breast cancer and to aid clinical decision making. 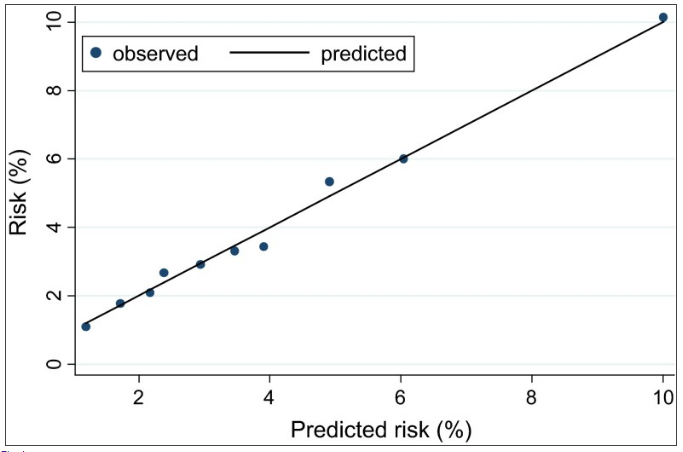 The probability measure of the predictive ability given as the c-statistic (area under the ROC curve) was 0.71 for the 5-year risk of LRR (95% CI: 0.69-0.73), indicating good discriminating ability. In addition, the model showed good calibration (Figure 1).